THOR: RAGNAROK Now Available from MARVEL Studios on Digital/Movies Anywhere + Coming Soon to BluRay & DVD! Thank you to Marvel Studios for providing me with product in exchange for my honest review. All thoughts are my own. This post may contain affiliate links. What's the best way to make my husband's day? Surprise him with the latest release from MARVEL Studios, of course! As busy parents, we don't get to go on 'dates' very often, which means that we hardly ever get to go to the movies. We love movies, and love to watch movies at home, so when we're able to add top favorites to our home movie collection, it's always a great day! When THOR: RAGNAROK hit theatres last summer, we knew we wanted to see it, but it just didn't happen. We were so bummed, too, because we love all of the MARVEL Studios movies, and THOR is one of our favorite MARVEL characters. 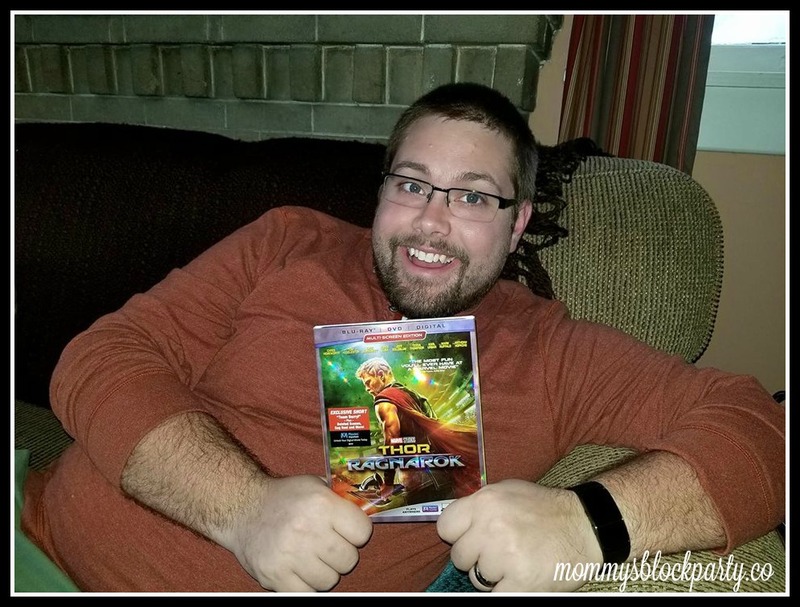 We were thrilled to be sent a copy of THOR: RAGNAROK on BluRay/DVD/Digital and watch it on the 'little big screen' at home. We got the kids to bed early, popped some fresh popcorn and settled in for 2 hours of non-stop fun! This movie is a thrill-ride! Being introduced to new characters was so much fun- though I did miss some of the old castmates from previous THOR installments. I don't really follow MARVEL comics outside of the movies, so I had no idea that there was a (SPOILER ALERT) third sibling! I love Loki and his antics- he causes plenty of trouble for THOR in this movie. Jeff G. was hilarious in this movie- one of the best roles I've ever seen him in (The Grandmaster), and of course, Chris Hemsworth and Mark Ruffalo were incredible. The story offered plenty of sentiment, and a lot of laughs- though I have to say that some of the writing was a just on the cheesy side for me. We're used to seeing a strong, confident, cocky THOR, and he was just plain silly throughout THOR RAGNAROK. I prefer the hunky hero without a side of cheese, but that's just my personal preference. This movie was very exciting, and almost had a GUARDIANS of the GALAXY feel to it for me. My husband noted that he noticed the same thing- not that it's a bad thing, it just wasn't what we were expecting. THOR: RAGNAROK didn't disappoint, though- we were glued to the screen for the entire movie, and our 7-year-old is pretty bummed that he can't see this one yet (language, scary situations). This movie is a lot of fun, and if you're a MAVEL fan, you're going to want to add this one to your personal MARVEL movie collection. 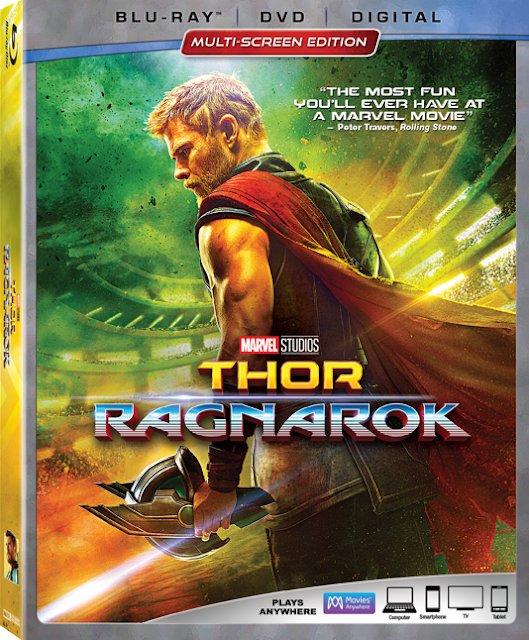 You can grab your own copy of THOR: RAGNAROK now on DIGITAL and on BluRay Combo on March 6th 2018. Look for it in the MBP Amazon Shop! Who's your favorite character from THOR RAGNAROK?